Here's where to watch every episode of Poldark season 1. Mouseover or tap an episode to see where to stream it. Click or tap the play icon to stream it on the best available service. 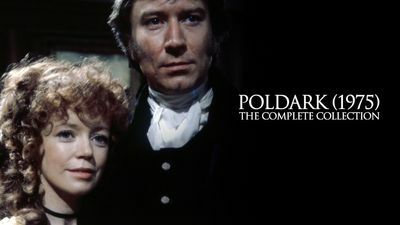 Episode 1 Oct 5, 1975 Ross returns from fighting for Britain in the American Revolution to his native Cornwall only to find his ex-fiance, Elizabeth, now engaged to his cousin Francis. Episode 2 Oct 12, 1975 Verity, Ross' cousin, is considered by everyone to be an old maid. They are all astonished when she attracts the attention of Captain Blamey at a ball. Unfortunately her father strongly disapproves of the match because the Captain is an ex-prisoner and former alcoholic. He forbids them to meet but Ross and Demelza take pity on Verity and encourage them to meet secretly so that Verity can get to know him better.Verity also tells Ross that Demelza is in love with him which amazes him. He still has feelings for the exquisite Elizabeth but he feels a growing affection for Demelza. Episode 3 Oct 19, 1975 Ross' former employee, Jim Carter, stands trial for poaching and Ross gives evidence in his defence.Demelza, taken in as a maid by Ross, falls in love with him but learns that Ross still loves Elizabeth. She seduces him and becomes pregnant, running away because she knows that he isn't likely to want the child. Episode 4 Oct 26, 1975 Ross learns that Demelza is pregnant and goes looking for her. Demelza gets into terrible trouble with her Puritan father and step-mother who can't stand the scandal. Before this Elizabeth finally agreed to run away with Ross and leave Francis whom she doesn't love. Episode 5 Nov 2, 1975 Ross decides to marry Demelza because she is pregnant to Elizabeth's great displeasure. Ross'daughter Julia is born and he holds a party to celebrate. Elizabeth is very unhappy and not nice to Demelza. Episode 6 Nov 9, 1975 When Jim Carter becomes seriously ill in prison, Ross worries that he will die before completing his sentence. Episode 7 Nov 16, 1975 Young Geoffrey Charles is stricken with a serious illness; when Francis also becomes ill, Demelza assists Elizabeth in caring for him. Episode 8 Nov 23, 1975 Mark Daniel learns of Keren's affair with Dwight Enys; Ross helps Mark avoid capture by the authorities. Episode 9 Nov 30, 1975 Arrested for his role in the shipwreck riot, Ross seems doomed to an unfair trial. Francis seeks to make amends with Demelza, but his guilt over his part in her husband's fall from grace threatens to push him over the edge. Episode 10 Dec 7, 1975 Demelza does everything in her power to stop Ross from being unjustly convicted, but the odds are stacked against him. The key to the trial lies in the hands of former servant Jud Paynter—a tipsy layabout easily swayed by drink and coin. Episode 11 Dec 14, 1975 Furious over Ross's continued success, the Warleggans hatch a plan to financially devastate the Poldarks. At the same time, Ross and Francis agree to settle their quarrel and begin again as partners. Jud, too, has a business proposal for Ross, but it comes with many risks. Episode 12 Dec 21, 1975 After an irate Warleggan and his henchmen punish Jud for his loyalty to the Poldarks, Ross's simmering dislike for George boils over into violence. Demelza has some surprising news, but her husband's reaction is even more shocking. Episode 13 Dec 28, 1975 Trying to improve their financial situation, Demelza puts herself in mortal danger. A newly optimistic Francis pays a high price for his partnership with Ross, and the family seems to be on the brink of ruin once again—until an anonymous benefactor steps in. Episode 14 Jan 4, 1976 Ross determines to find Mark Daniel who may be able to remember where he saw copper while hiding down Wheal Grace. To do so he must accompany Trencrom's smugglers to the Scilly Isles, which is dangerous as there is an informer amongst them. Episode 15 Jan 11, 1976 Elizabeth accepts an offer of marriage, although she knows it will appal Ross. when tragedy strikes at Wheal Grace the double blow creates in him an unreasoning and obsessive reaction. Episode 16 Jan 18, 1976 Ross goes to Trenwith to confront George for the last time.